KCET 2019 Karnataka Common Entrance Test - Applications are invited from eligible candidates of Karnataka including the wards of Jammu & Kashmiri Migrants for registration to the "Common Entrance Test-2019" to Professional Courses detailed herein for the seats to be notified by the Govt. in the Professional Educational Institutions in the state of Karnataka for the academic year 2019-20. 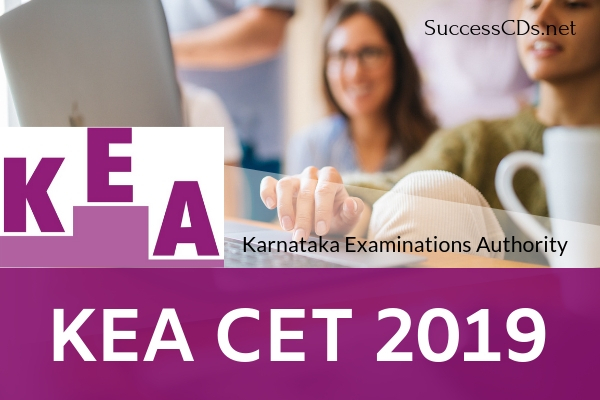 Karnataka Examinations Authority (KEA) will organize the Karnataka Common Entrance Test (KCET 2019). It is state level entrance test also known as Karnataka CET 2019. Applications can be submitted through online from 11.00 am on 01st February 2019 to 28th February 2019 up to 05.30 pm and the last date to pay the prescribed fees in the specified banks or at e-post office is 06th March 2019. Common Entrance Test - 2019 Admission to Engineering, Architecture, Farm Science Courses, B.Pharma etc. Professional Courses (Instructions and Guidelines) (NOT for Medical / Dental / AYUSH Courses). To the 1st year or 1st Semester of full-time Courses for Govt. share of seats in Engineering, Technology, Architecture, Farm Science Courses i.e., Bachelor of Veterinary Science and Animal Husbandry (B.V.Sc. & A.H.) B.Sc. (Hons) Agriculture, B.Sc. (Hons) Sericulture, B.Sc. (Hons) Horticulture, B.Sc (Hons) Forestry, B.Tech. Bio Technology, B.Sc. (Hons) Community Science, B.Tech (Agri.Engg), B.Tech (Food Technology), B.Tech (Dairy Tech), B.F.Sc (Fisheries), B.Tech (Food Science & Tech)., B.Sc. (Hons) Agri. Marketing & Co-Op, B. Pharma and Pharma-D Course, in Govt./University /Private Aided / Private Un-Aided Professional Educational Institutions in the State of Karnataka for the academic year 2019-20. The candidates who wish to seek admission to Medical or Dental or AYUSH [Ayurveda, Yoga & Naturopathy, Unani & Homoeopathy] courses must compulsorily qualify in the NEET exam conducted by the CBSE Board, New Delhi. The candidates who qualify in the NEET 2019 exam will only get the eligibility for admission to Medical or Dental or AYUSH Courses through KEA for Govt. share of seats. For admission to Architecture Course candidate should compulsorily appear for NATA conducted by the Council of Architecture or for JEE Paper-2 examination. Visit www.nata.in and www.nata.nic.in. No candidate shall be eligible for admission to Govt. Seats unless he is a citizen of India. The candidates who have passed the qualifying exam other than the universities listed in the notification at VTU Website are NOT eligible and candidates who have passed from Karnataka State Open University are also NOT eligible. A candidate who is appearing in the qualifying exam, i.e., 2nd PUC / 12th Standard in 2019 whose result is awaited, may apply and appear for Common Entrance Test 2019 but he/she shall not be eligible to any of the course specified, if he/she does not pass the qualifying examination with the required pass percentage of marks. Courses Ayurveda, Homoeopathy, Unani, Naturopathy and Yoga: Candidates must have Passed in 2nd PUC/12th Std./Equivalent Exam with English as one of the Languages and obtained a Minimum of 50% of Marks in aggregate in Physics, Chemistry, Biology subjects (40% for SC, ST, Cat-1, 2A, 2B, 3A & 3B category candidates). Candidates must have Passed in 2nd PUC/12th Std./Equivalent Exam with Mathematics as compulsory optional subject and obtained a Minimum of 50% marks in aggregate in all the Subjects. (45% for SC, ST, CAT-1, 2A, 2B, 3A and 3B category candidates). Criteria for Determination of Merit/Rank: The norms prescribed in NEET/ NATA/ JEE paper-2; Admission Rules; relevant Government orders is applicable in determining the merit for admission to Medical/ Dental/ Ayush/ Architecture courses as the case may be. Candidates must have Passed in 2nd PUC/12th Std./Equivalent Exam with English as one of the Languages and obtained a Minimum of 45% of Marks in aggregate in Physics and Mathematics along with Chemistry/Biotechnology/Biology/Electronics/Computer (40% for SC/ST, CAT-1, 2A, 2B, 3A & 3B category candidates). Criteria for Determination of Merit/Rank: By taking marks in equal proportions in QE and CET in PCM subjects (No minimum marks prescribe in CET). Passed in 2nd PUC/12th standard with Physics, Chemistry and Biology as optional subjects. Passed in 2nd PUC/12th standard and obtained an aggregate minimum of 50% marks in Physics, Chemistry, Biology and English subjects (40% for SC/ST/Cat-1, 2A, 3A and 3B category candidates). Criteria for Determination of Merit/Rank: By taking marks in equal proportions in QE and CET in PCMB subjects (No minimum marks prescribe in CET). In the case of Agriculturist Quota, the merit list will be prepared based on 25% marks each, secured in concerned combination in II-year PUC (PCMB) and CET and %0% marks secured in the Practical Test. In case of B.V.Sc and AH merit will be prepared based on 50% of marks secured in CET 9 Physic, Chemistry, and Biology) and 50% marks secured in the Practical test. Minimum of 50% marks in Practical Examination is required to claim seats under Agriculturist Quota. Further, Agriculturist Quota is applicable only for courses of Farm Science and B.V.Sc & A.H. Passed in Diploma in Pharmacy Exam from an institution approved by the Pharmacy Council of India under Section 12 of the Pharmacy Act and has secured minimum of 45% marks (40% for SC/ST/CAT-1, 2A, 2B, 3A and 3B category candidates). Passed in Diploma in Pharmacy Examination from an institution approved by the Pharmacy Council of India Under Section 12 of the Pharmacy Act and has secured minimum of 45% marks (40% for SC/ST, Cat-1, 2A, 2B, 3A and 3B category candidates). Criteria for Determination of Merit/Rank: Only on the basis of marks obtained in PCM or PCB Subjects (whichever is higher) in CET. (No Minimum Marks prescribed in CET). Passed in 2nd PUC/12th standard /equivalent exam with Physics, Chemistry and Biology or Physics, Chemistry and Mathematics; or Passed in Diploma in Pharmacy Exam from an institution approved by the Pharmacy Council of India under Section 12 of the Pharmacy Act. Criteria for Determination of Merit/Rank: Only on the basic of marks obtained din PCM or PCB subjects (whichever is higher) in CET. (No minimum marks prescribe in CET). After the completion of the entrance test, the Provisional ANSWER KEY will be published on the date notified by KEA on the KEA Website http://kea.kar.nic.in. The candidates / parents / lecturers can file their objections, if any, addressed to the “Executive Director, Karnataka Examinations Authority, Bangalore” on or before prescribed date either in person or only through SPEED POST / email: keauthority-ka@nic.in, with regard to any of the published answer Key, along with all supporting documents / justification. Step1: Please download the e-brochure from KEA Website https://kea.kar.nic.in and read the instructions carefully before start entering the application online. Enter all the details online by browsing URL on web https://kea.kar.nic.in by selecting "CET-2019 UG Online Application. After completion of entry of all the details candidate's will receive an application ID & Password to their registered mobile phone number and to email address and also the same information will be displayed on the screen. Step 2: Upload the scanned copy of recent passport size Colour Photograph, Signature and Left- Hand Thumb Impression in JPG/JPEG format separately. Step 3: Print the Challan copy that is in triplicate. Candidates of Karnataka origin have to pay an amount of Rs.650/- for General and OBC (Rs.500/- for SC/ST Category-1 of Karnataka candidates only); Rs.750/- in case of candidates residing outside the state of Karnataka & Rs.5,000/- in case of candidates residing outside India. The candidates who are residing outside India shall pay the fees in the form of DD drawn in favour of Executive Director, Karnataka Examinations Authority, payable at Bangalore. Step 4: Take a printout of the application form on A-4 Size paper. Obtain Principal seal and signature from the college where you have studied 2nd PUC or 12th Standard on the space provided in the printed form; the same copy should be produced during document verification. For more details visit the KEA website https://kea.kar.nic.in. KEA Helpline Nos. : 080 - 23 460 460 (Five Lines) 9.30 am to 6.00 pm (except General Holidays).